I'm mostly getting ready for World Fantasy Con in Columbus. Working on some new rings among other things. 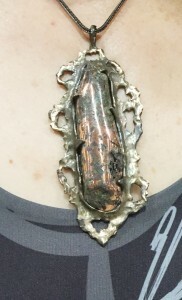 I wanted to put up both an image of the copper ore cabochon pendant I wrote about earlier and what it looked like on the woman who bought it at the Kansas City Worldcon. I had a lot of trouble getting both the highlights on the metal and the vivid color of the stone, but the light at Worldcon worked. 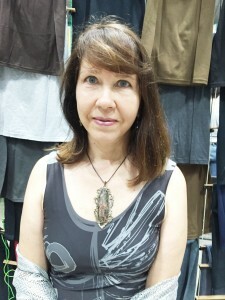 Photograph of Cheryl Brin, who purchased the design at Worldcon.